When students go to college, they normally reside in a dorm which they should maintain and clean on their own. However, there are instances when the presence of pests cannot be avoided. If it is your first time living in a dorm, here are some of the pests that you might encounter, spiders, stink bugs and potentially bed bugs. 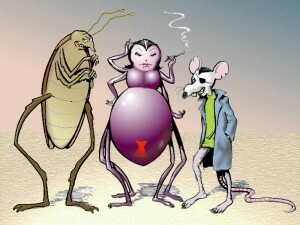 With bed bug removal being the most difficult of all and should be left to professionals we will discuss the rest. We asked regional pest control company a few questions about the pests that cause the most problems in dorm rooms. You can read the answer bellow. Some people would literally jump just by seeing a spider, as these are unwelcomed guests that can be found inside the room. Naturally, spiders are attracted by two things, light and moisture. Most of the time, you can see spider webs by the window or in the corners of the room. If these webs exist, it would be best to get rid of them using a vacuum. Make sure that you do not leave any clutter around, as spiders can easily spin webs from a cup or stack of papers. This bug seems to make its way through the dorm walls, and this is usually seen during winter months, as they try to find another shelter. Killing this bug will result to a foul odor and the best way to prevent this is to make sure that all entry points are sealed, such as the doors and windows. Just like the stink bugs, lady bugs normally pester rooms when trying to find shelter and the best way to deal with these is to seal all entry points. – Make sure all window screens are free from holes or tears. – Dust on a regular basis. If you can get rid of the dusts in areas that are used rarely, this can significantly reduce the risk of having bugs in your room. – Make sure no space exist between the floor and the door. These spaces can serve as the entry point for these pests. – Avoid leaving damp towels or clothing around. Wet clothes should be hang up properly and allowed to dry up before placing it in your hamper. – Secure all your foods and do not leave open food packages lying around, as these can attract pests. – In case you are seeing pests in your door room, avoid killing them. For example, the stink bug releases a scent that can attract other pests into that area so it would be best to catch and throw it outside instead. In case, your dorm room is heavily infested by any of these pests, it would be best to find a bug spray that can help you deal with these pests effectively. There are bug sprays that contain chemical ingredients that can even help you prevent these pests from coming back. However, if you do not want to deal with these on your own, you can also seek the help of a professional pest exterminator to handle the problem for you. You can find one near your area by simply searching the internet.